Telemachus: Remember Those M&Ms We Told You About? Remember Those M&Ms We Told You About? We are glad we didn’t jump up and down and bet the mortgage that the ‘historic’ (sic?) budget agreement agreed to by President Obama and Congress last Friday was ‘a great leap forward for mankind’ as many of the politicians in Washington wanted you to believe. Now that the CBO has come out with their explanation of the details, and Congress just passed it last night, we almost felt as if those M&Ms we ate as part of our market research are now coming right back up, to be honest about it. There’s a lot of smoke-and-mirrors to this ‘historic deal’ so bear with us. Remember the M&Ms we talked about last week? How this deal only amounted to cutting the equivalent of ½ of 1 M&M out of a pack of 55 for your kid’s daily sweet tooth quota of M&Ms? Well, now that the details have been published and analyzed by CBO, we all of a sudden find out: ‘It won’t.’ It won’t cut the budget by the equivalent of even ½ of 1 M&M as we previously were led to believe. It won’t cut the equivalent of ¼ of 1 M&M either. Or 1/8th of 1 M&M. Or 1/16th of 1 M&M and not even 1/32nd of 1 M&M from your child’s daily sweet tooth diet. As far as we can ascertain, we think this ‘historic budget deal’ will actually amount to the equivalent of licking 1 of the letter ‘M’s off the logo on the candy shell of 1 M&M in the entire packet. THAT is what this ‘historic’ budget deal will save in actual cash outlays or money spent in relative terms between now and September 30, 2011. Seriously. 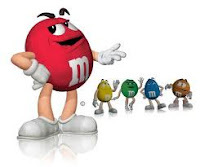 This budget deal, by proportion, will amount to licking off the sugar molecules that are used to print just 1 measly ‘M’ on 1 M&M out of a pack of 55 M&Ms. The problem is that these budget chickenhawks decided to pull a fast one on the American people and focus on reducing something called ‘BA’ or ‘budget authority’ instead of ‘outlays’. Outlays represent the actual cash money that has to be spent to fund federal programs. Outlays are what we always focused on when we served on the House Budget Committee from 1991-1994 and helped put together $500 billion in ‘real’ hard money spending cuts over the 5-year time frame used back then. BA was just a column of numbers that we didn’t pay much attention simply because it was passed by the authorizing committees and was always considered the high end of what could possibly be spent in the fiscal year coming up. It just was not that ‘real’. So now, your President and leaders in Congress are trying to get you and the rest of the American public to believe that something “HUGE!” was done to address our spending/deficit crisis. Don’t fall for it. All they did was lower the outer bands of what could ‘potentially’ be spent, not reduce the actual dollars spent this year like we were led to believe just last week to the tune of $39 billion. Think of it this way: BA is what your parents would allow you to spend on a pack of M&Ms each day in the worst case scenario, even though they know you can buy a pack usually for $1.00. Perhaps they think you might get stuck at a professional football game where a food service can price-gouge you because you have nowhere else to get something to eat. Let’s say your BA was set at $1.50. This ‘deal’ would say that from now on, son, your ‘worst-case’ BA is now ‘only’ $1.25 per pack each day. Voila! Your parents have imposed ‘draconian’ spending budget authority restraints on you of close to 17%! But you still get to buy the $1.00 pack of M&Ms every single day for the rest of the year. You haven’t exceeded your authority as long as you keep buying M&Ms at the regular price. Because there is actually $350 million in cash being saved this year, (but not the $39 billion we were promised), there will be the equivalent of 1 licked-off ‘M’ from 1 single solitary M&M in the whole package of 55 candies. But it is not the $39 billion we were told it would be just last week. We will acknowledge that the $39 billion in reduction of BA this year will lower the baseline BA projections for the next 10 years by commensurate amounts. The total ‘lowering’ of BA accounts for over $340 billion over the next decade which means Congress will be slightly more ‘constrained’ by what they can and cannot spend over that time period. But c’mon, people! $340 billion over the next 10 years is nothing when you realize they we are due to add on another $10 trillion in debt by 2022 unless we do something dramatically different and do it pretty soon. That is 30 times the amount ‘saved’ in BA this week. This budget deal is not all it is cracked up to be. Even the M&M characters would melt in your hand over the shame of it all. A ‘Historic’ Budget Agreement!---Say What?